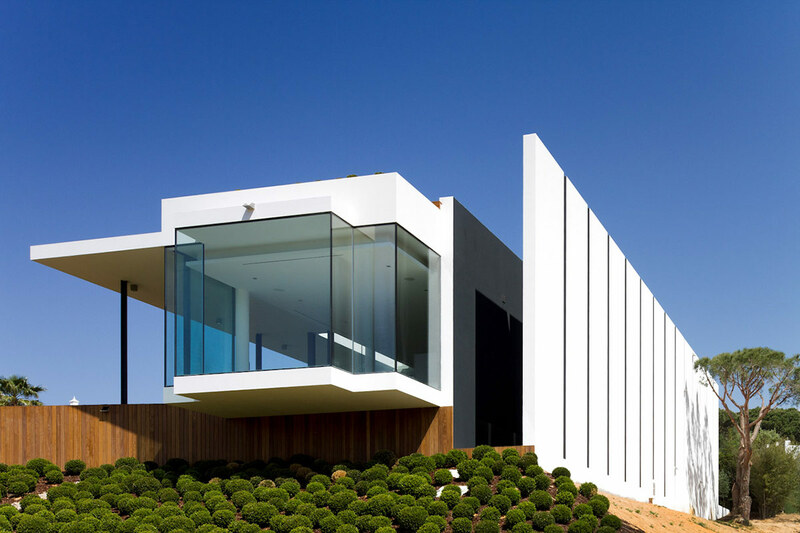 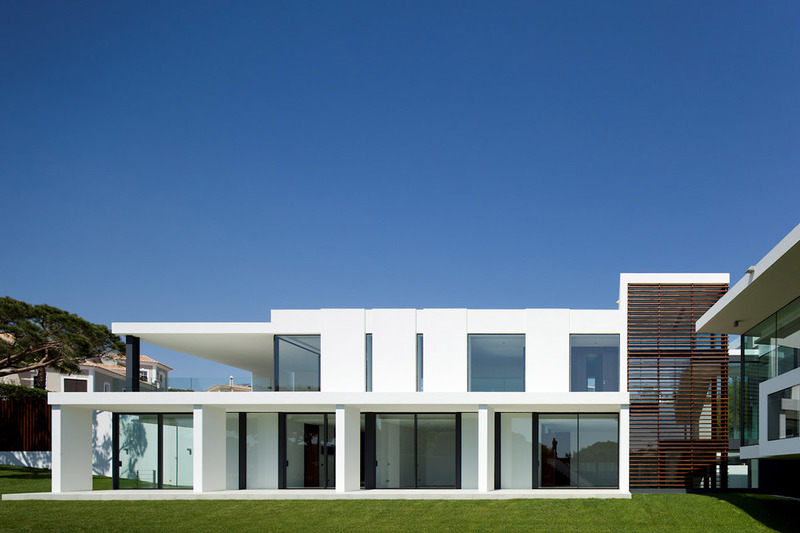 Casa Vale Do Lobo was completed by the Portuguese studio Arqui+. 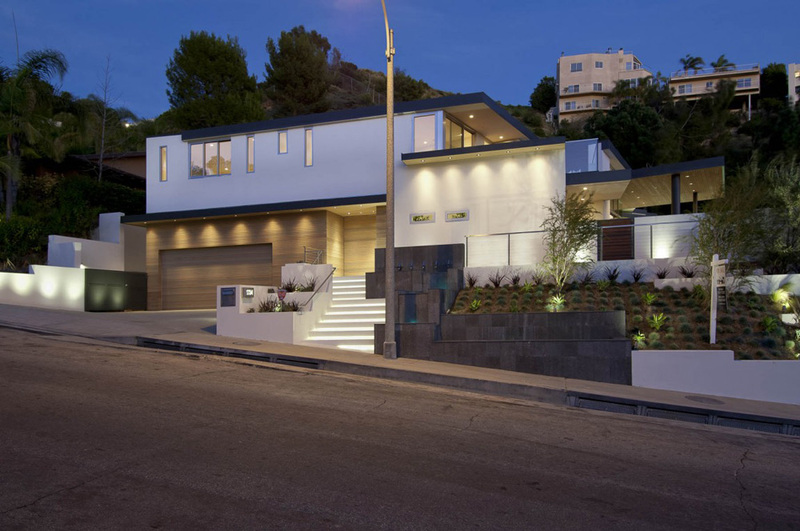 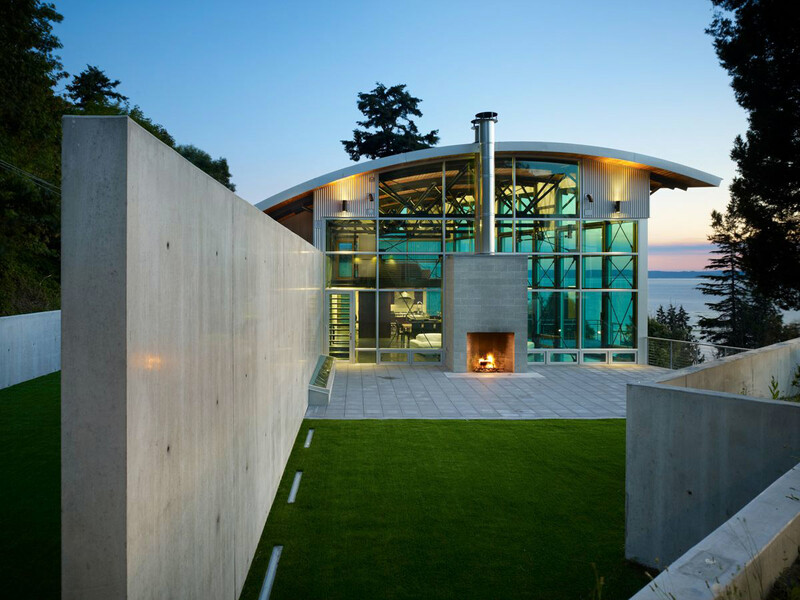 This 6,450 square foot contemporary residence has been developed in a U shape around a central courtyard. 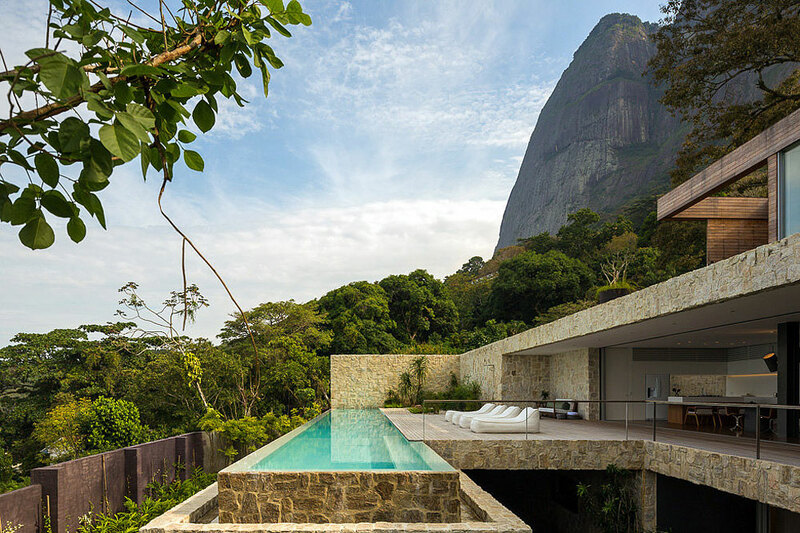 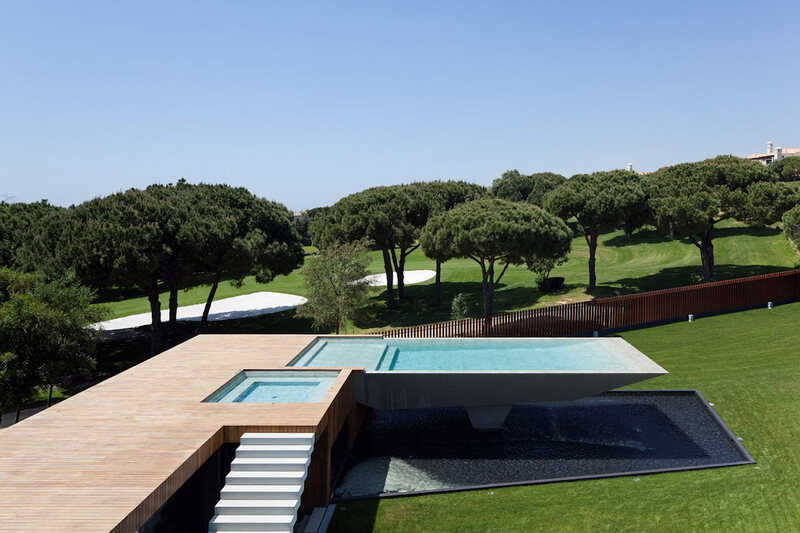 A suspended pool forms the main focal point of the villa. 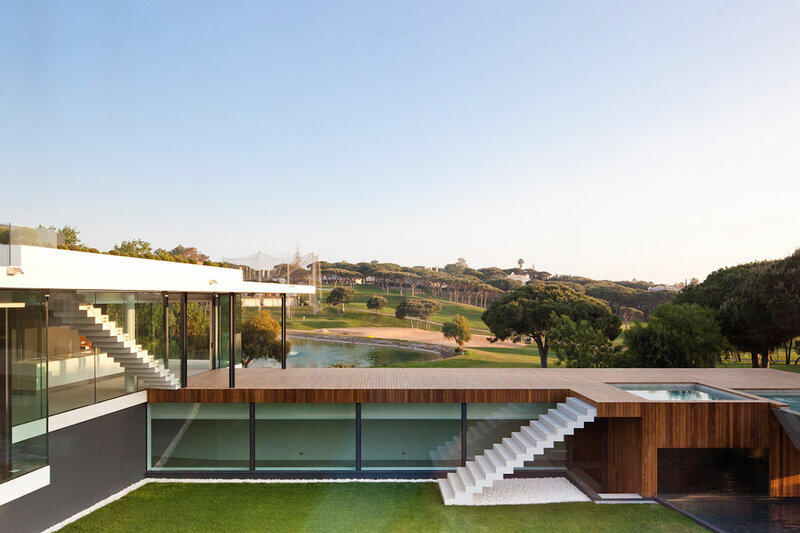 The villa is located in Vale do Lobo, a golf resort in the Algarve region of Southern Portugal. 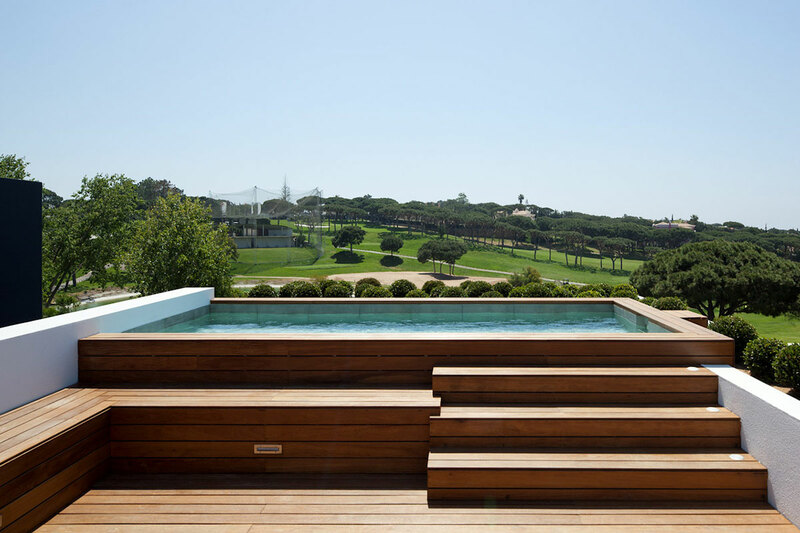 “The Villa is situated in Vale do Lobo, a luxury golf and beach resort in Southern Portugal. 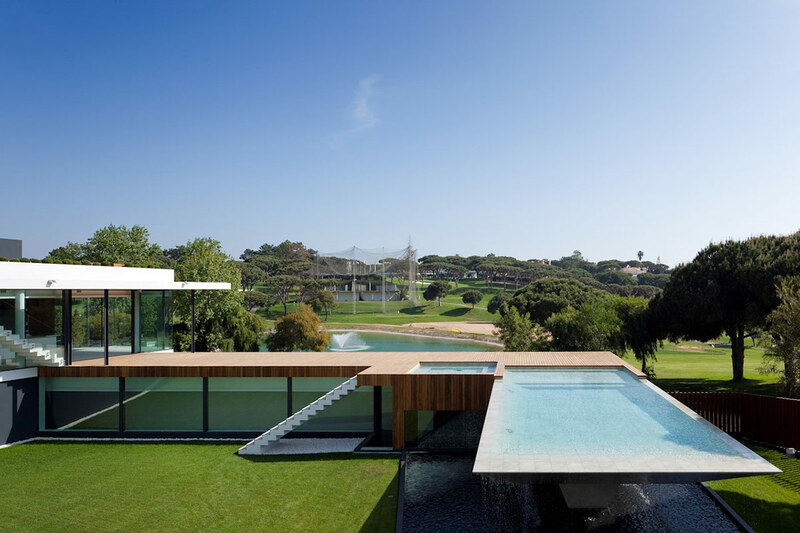 The plot is an end plot surrounded by golf, greenery and a small lake. 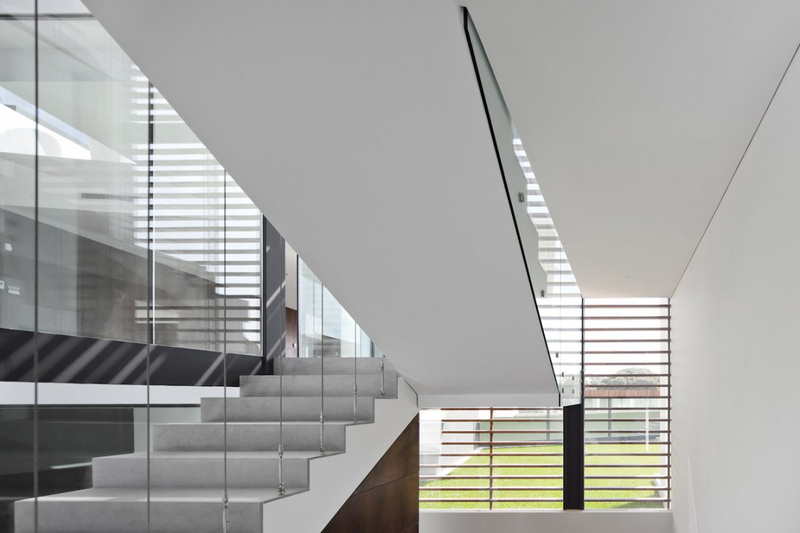 Due to the location we have purposely opted not to create a clear boundary between plot and surroundings, rather using the actual building to create the distinction between public and private spaces. 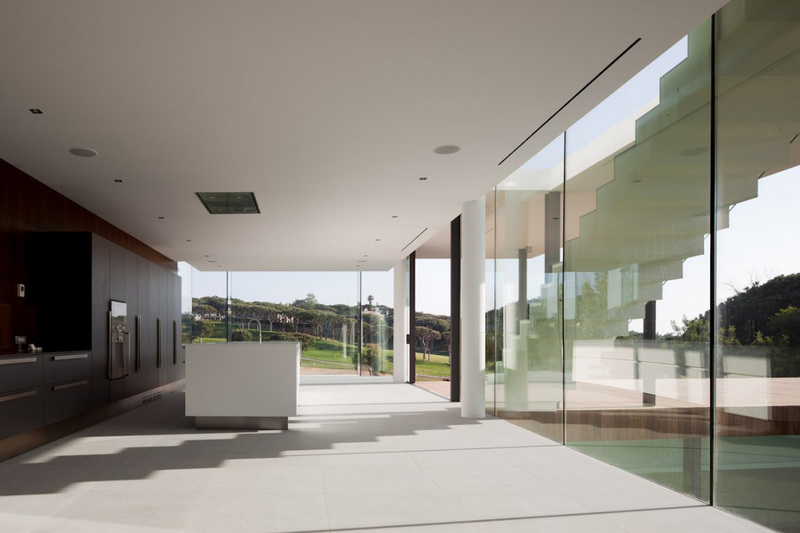 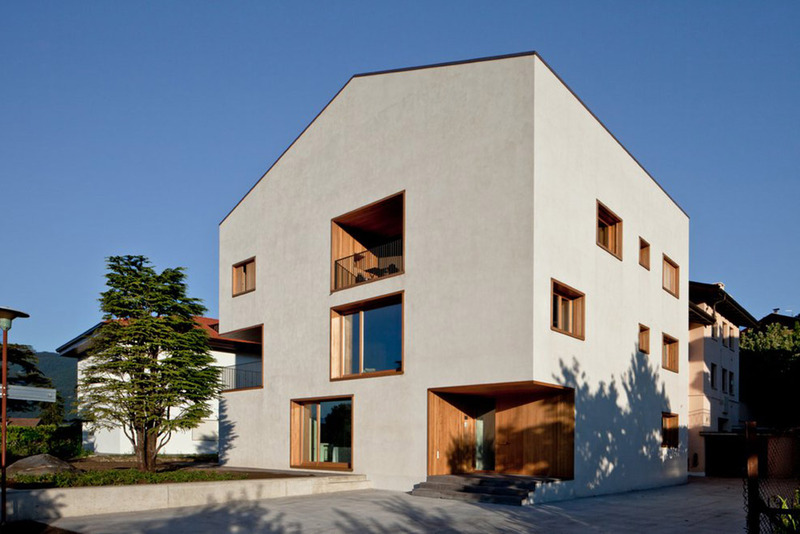 The villa has been developed in a U shape around a central courtyard space helping to create a sense of scale and containment within the open surroundings. 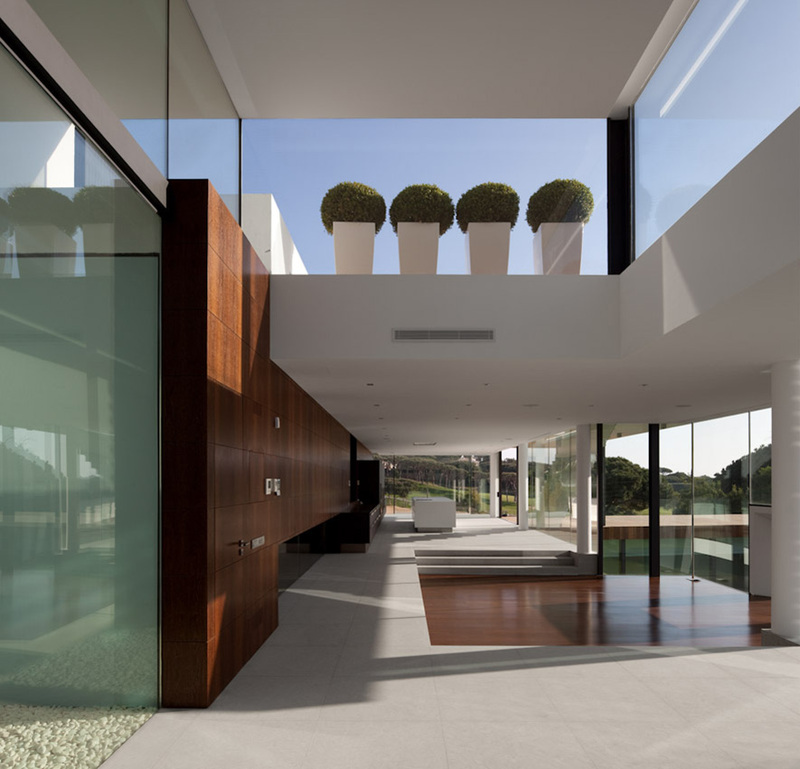 Within this courtyard we have created a suspended pool which becomes the main visual focal point of the villa. 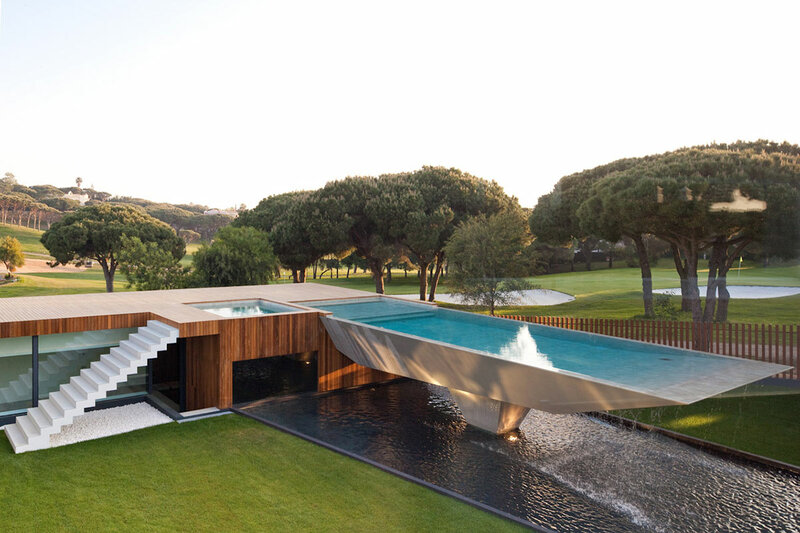 Being the main visual focus, we have opted for the creation of the pool as a sculptural element, while still serving the function as the main pool. 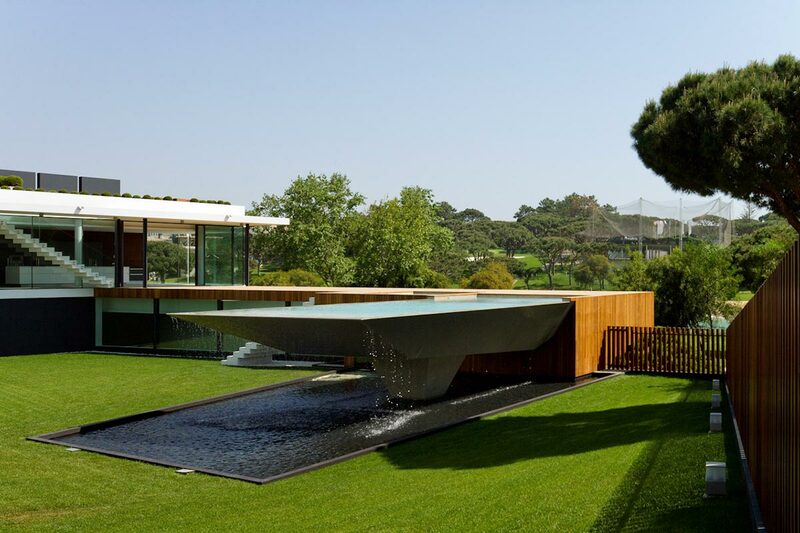 The suspended aspect of the pool permits the flow of the courtyard beyond the pool, thereby not containing the space. 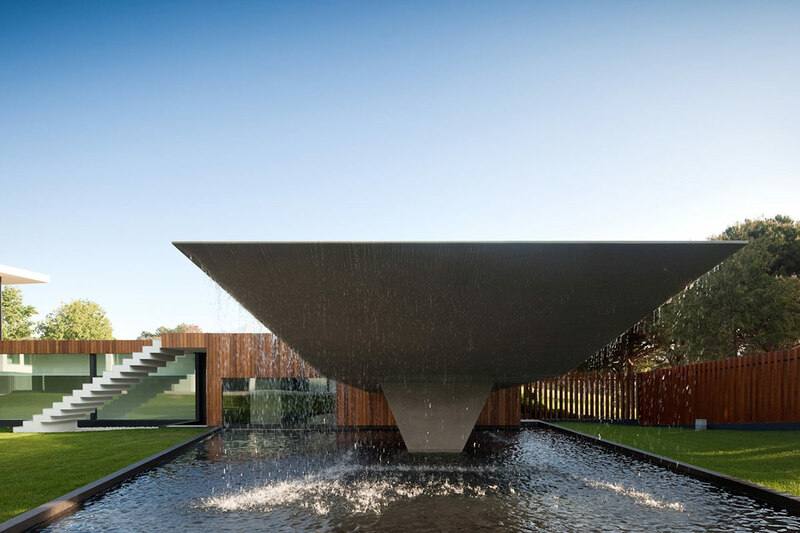 This upper main pool cascades down into a lower reflecting pool that can also be used as a children’s splash pool. 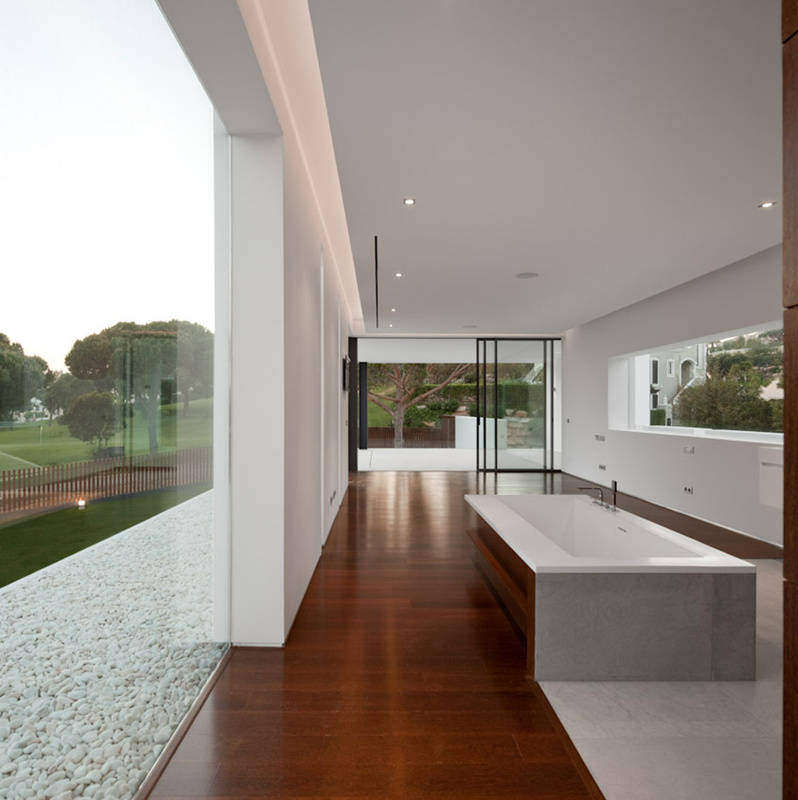 The sound of the running water creates a very calm and relaxing environment. 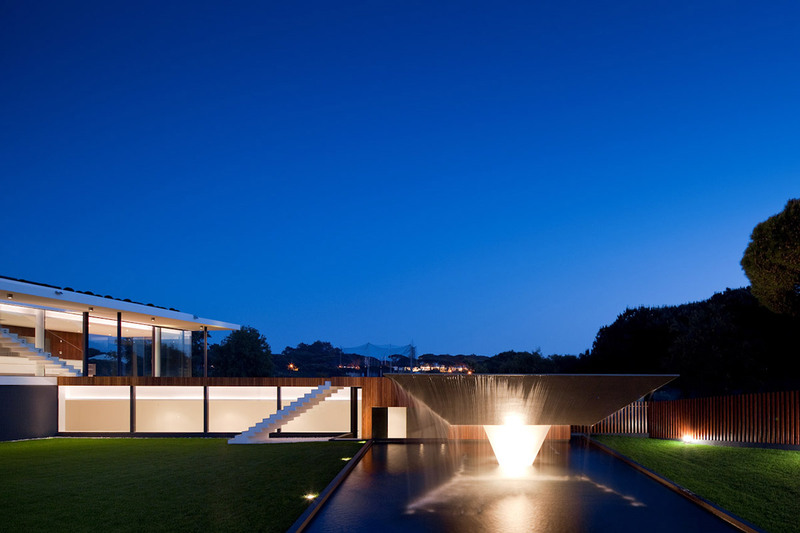 This lower reflecting pool in turn “visually” cascades down into the indoor pool situated within the home spa area. 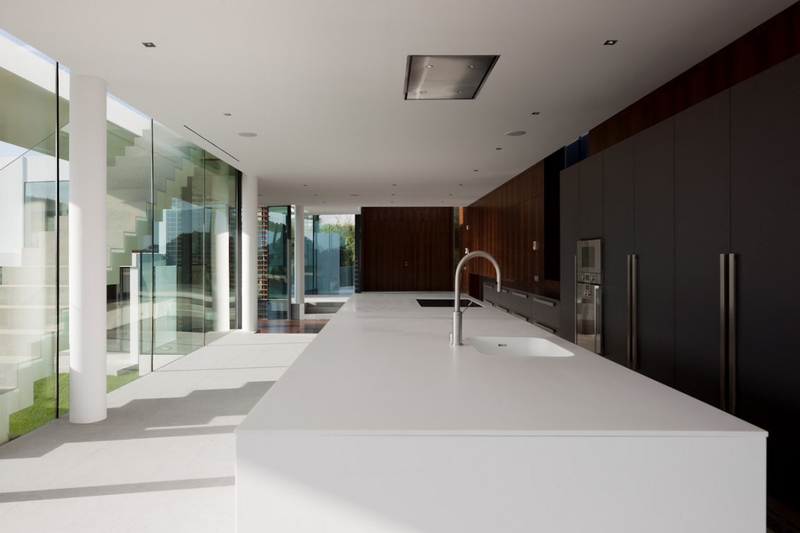 The continuation of the use of the black mosaic through into the home spa helps to strengthen this concept. 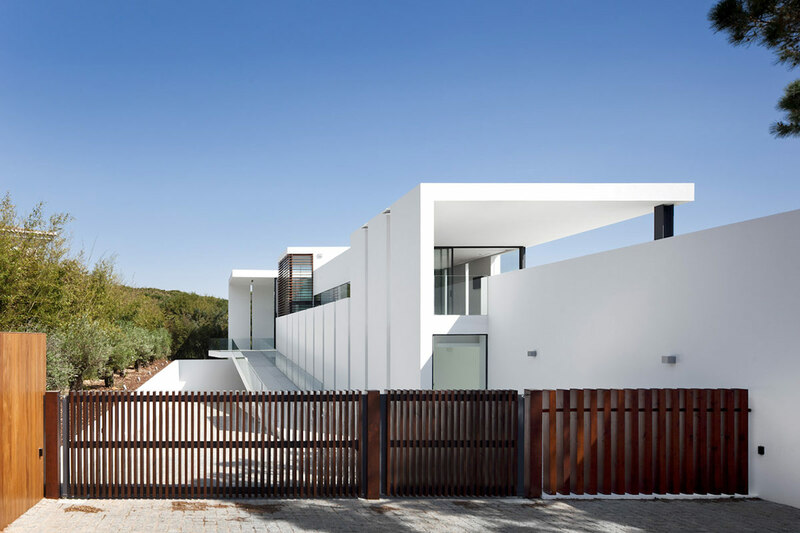 The outer perimeter of the main building volume has been demarcated with continuous repetitive vertical walls, almost like a fortress, establishing a clear barrier between public and private. 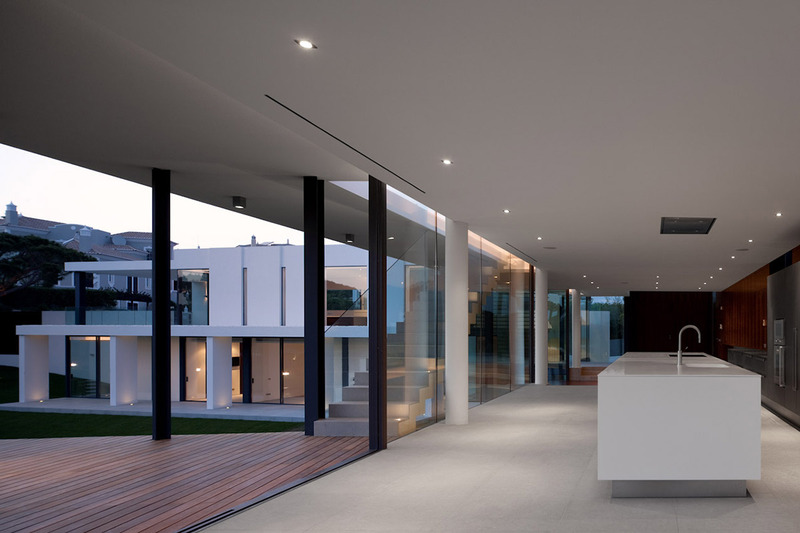 The spaces facing into the courtyard on the other hand offer maximum transparency, minimizing the barrier between indoor and outdoor spaces. 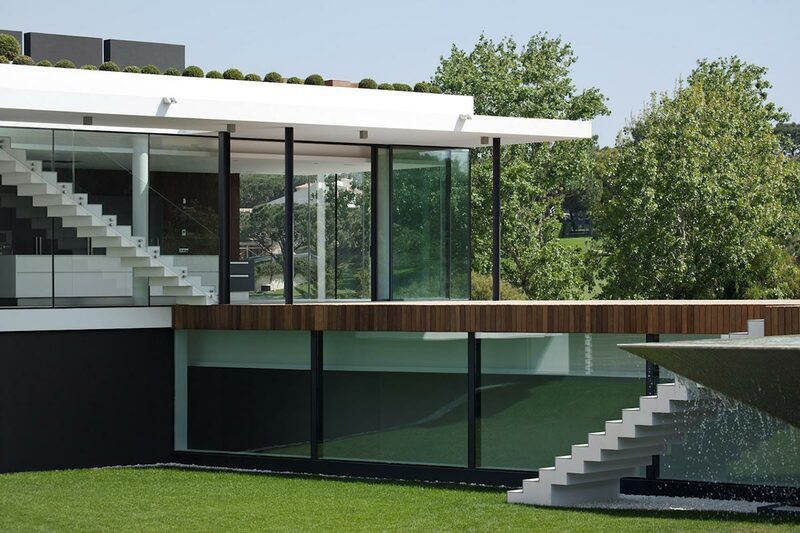 In order to strengthen the indoor and outdoor interconnection we have continued the same floor level through to the exterior with sliding doors that slide back fully with no distinct threshold between indoor and outdoor, extending the living spaces to the outdoor. 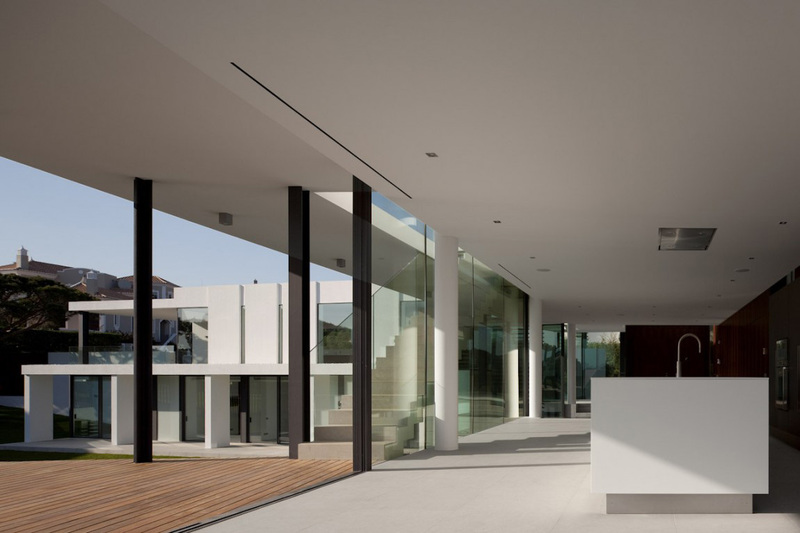 The main living spaces of the villa have been developed in an L shape plaster and painted white volume, with one wing dedicated to the 5 bedrooms and the other wing dedicated to the main living spaces. 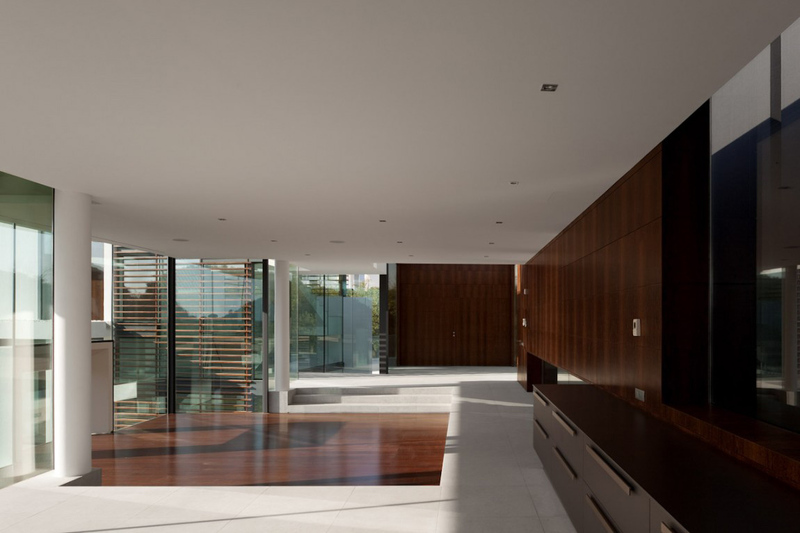 The single storey living space sits at an intermediate level between the 2 storey bedroom wing meaning easy access to the main living space from all bedrooms. 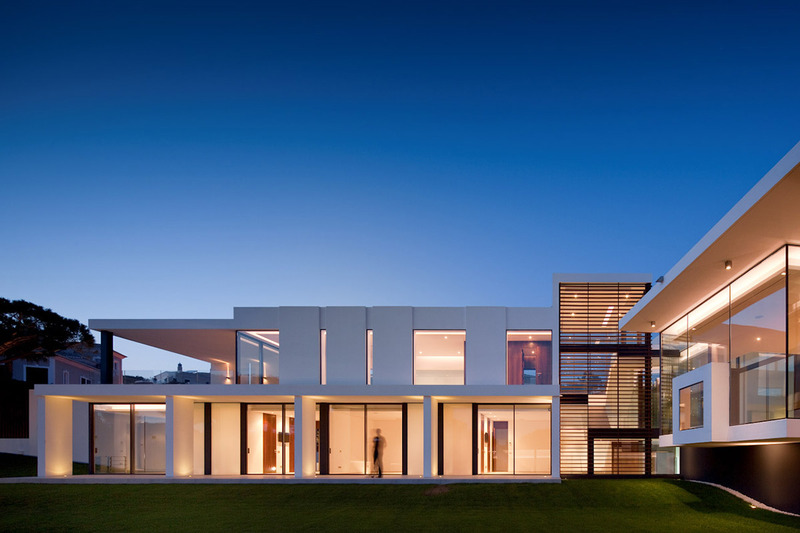 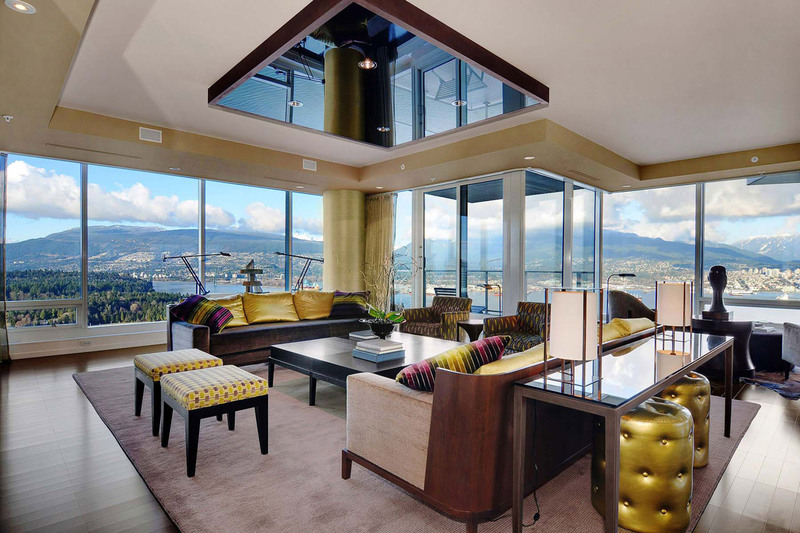 This main living volume projects out to the south in the form of a suspended glass cube in which we have placed a sitting area (snug) with fireplace opening onto the views of both the lake and the golf course. 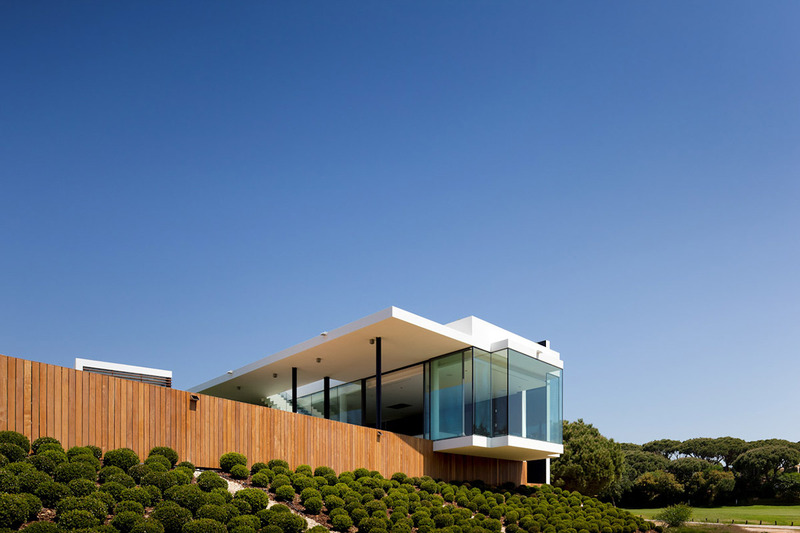 The roof of this volume serves as a roof terrace with mini-pool, outdoor living space and BBQ area for evening entertainment. 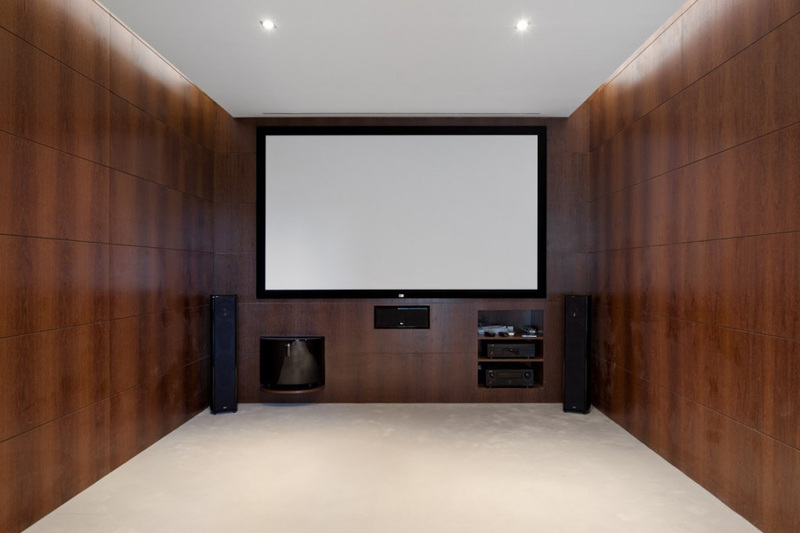 The semi buried basement space houses the main indoor entertainment areas of the villa, such as games room, home cinema and home spa, as well as the double garage and service areas. 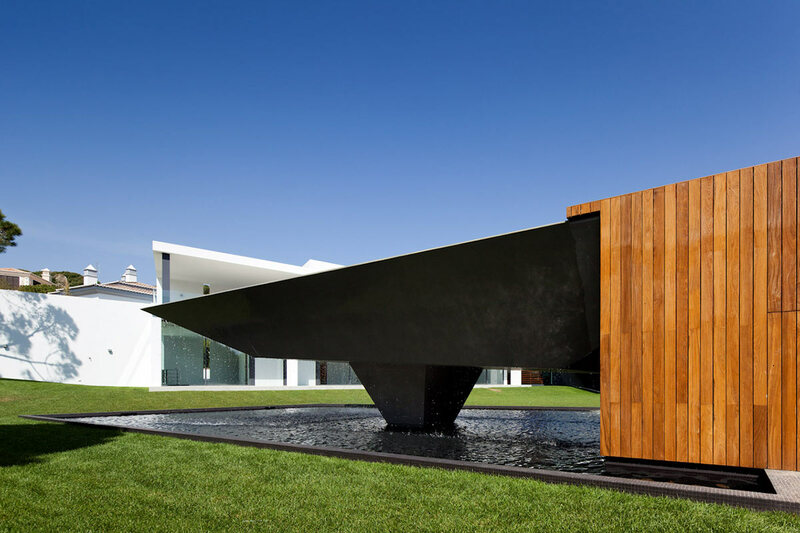 The home spa faced in the black mosaics at the end of the volume create the sense of an infinite space.